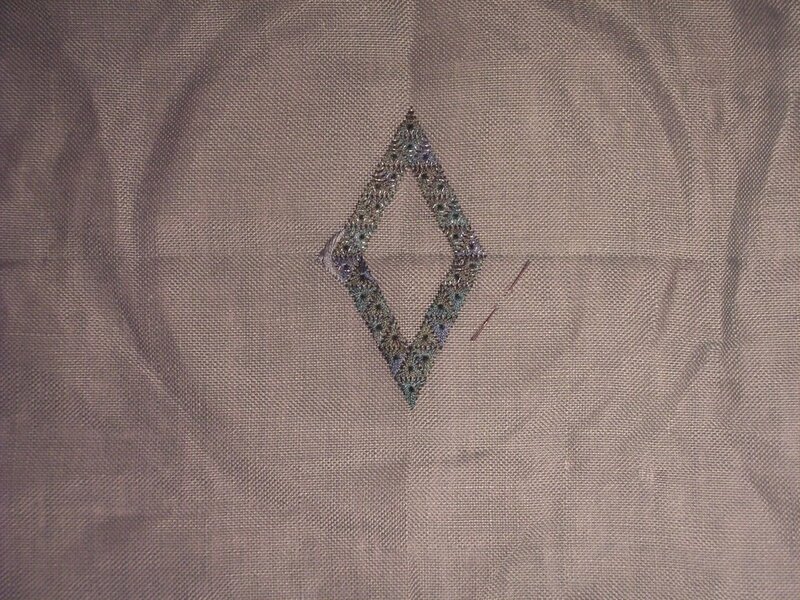 I got one of the corners done of the four in this part - it's come out really stunning, I think. 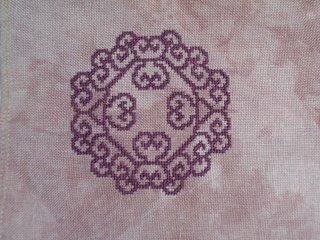 The more I stitch this design, the more I fall in love with the detail. 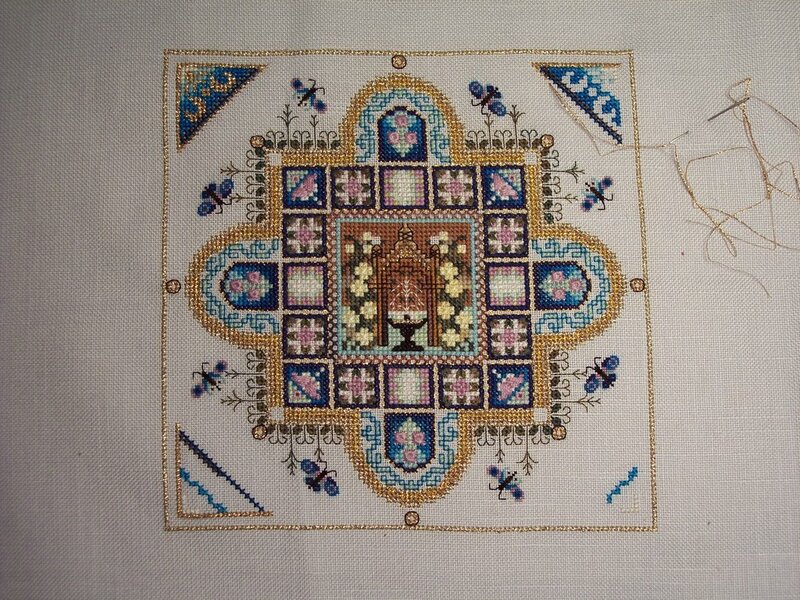 As of now, I'm almost done with the upper right hand corner, too, so I'm getting there. 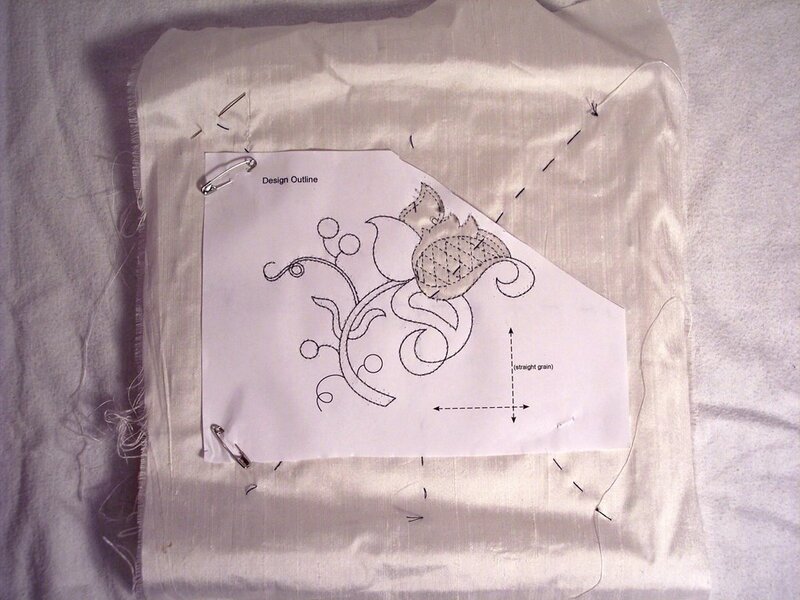 The next part looks like much less stitching than this one was. Maybe I can do some catching up? 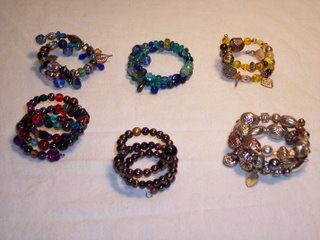 This is what I managed to accomplish in my two day seminar, titled Ribbons and Roses, by Deanna Powell. 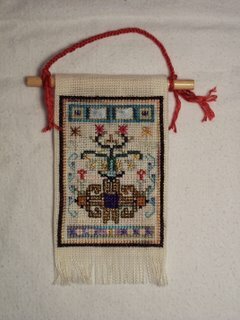 She taught it well and it will become a purse - but for now is out of the rotation until I can finish a project. I figured seven in rotation was enough for the moment, and probably too many. Anyway, this was a very good class for me. 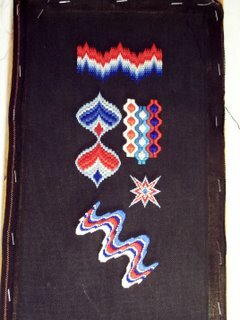 I'd never made bead "fabric" before, and got to learn the peyote stitch - her version - and it's not as hard as I thought. 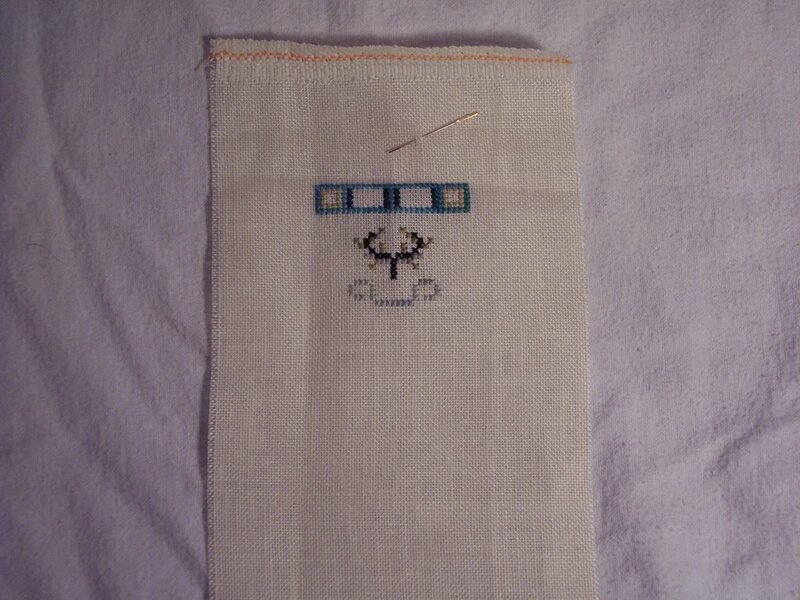 She uses two needles, which means you end up with less bulk on the side and less wasted thread. 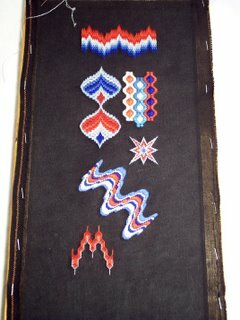 The small black square on the left is the beginning of the purse strap and the larger iridescent rectangle is one of the inside layers of the rose. 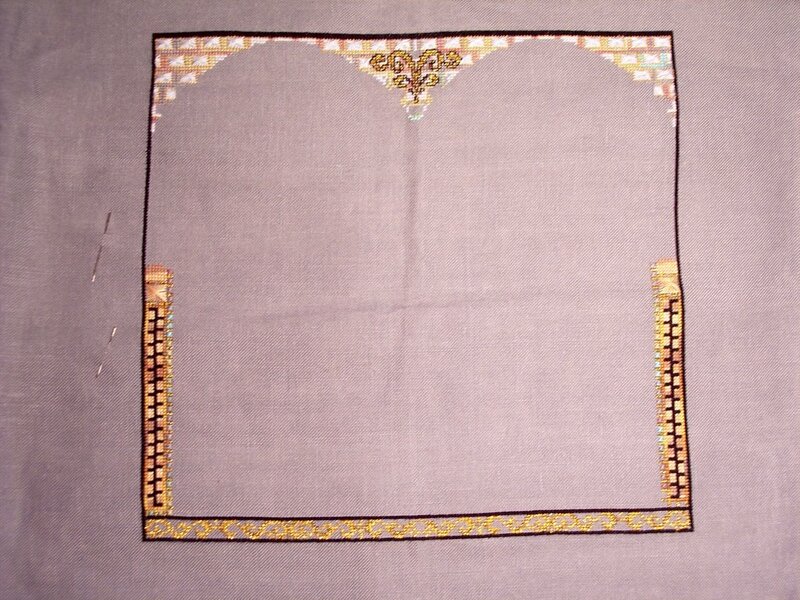 The pink strip between the two is the finished outer layer of the rose - beaded pink organza. 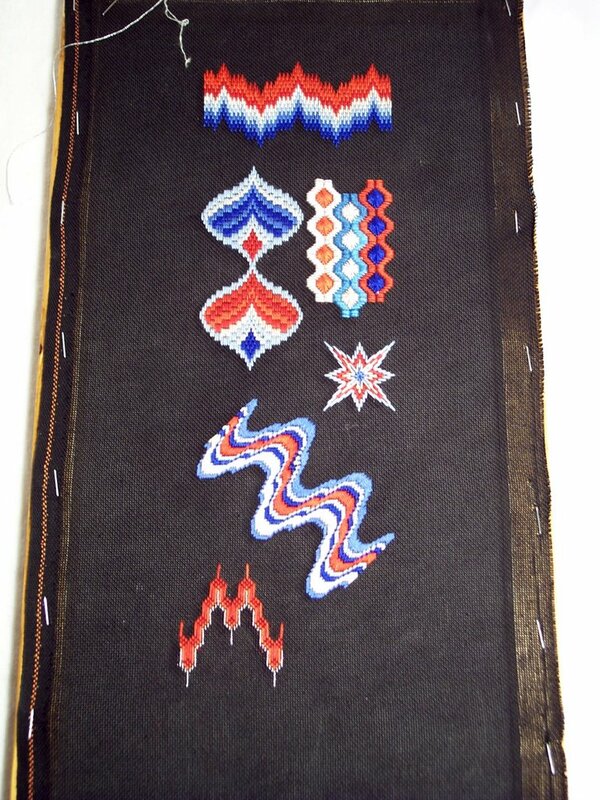 I've also started beading using a fly stitch down the areas where the ribbons join on the bag. 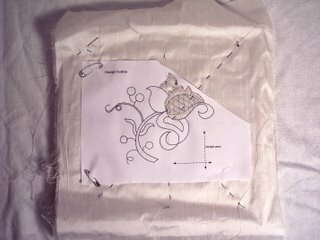 I'm not sure I'll use fly stitch on all the seams, though. I can see real progress on my Panda! 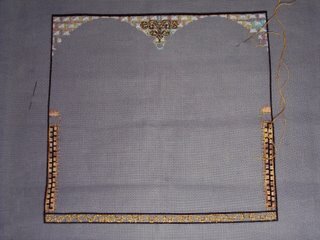 The whole back half of the big one is done - making this chart about a third of the way done. Yay! 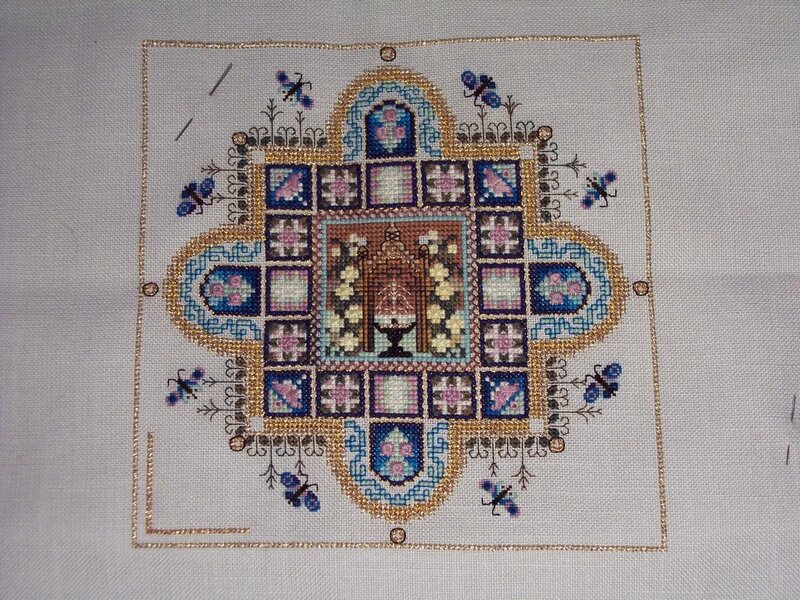 I hope to have this done by the end of November so my husband can frame it before Christmas. So, this was one of my Seminar starts - a one day class by Denise Harrington Pratt of Amaryllis Artworks. It was a good class and she had all of these little boxes and kits - each one different! Talk about a lot of prep time. 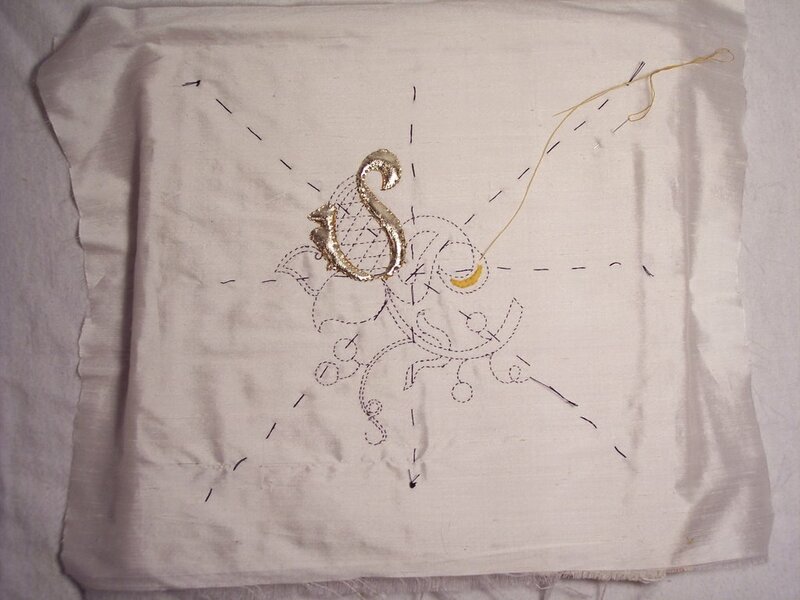 Anyway, she showed us some stitches and let us get to work. The diamond is completely made up of wrapped triangular eyelets - they look really nice in person. 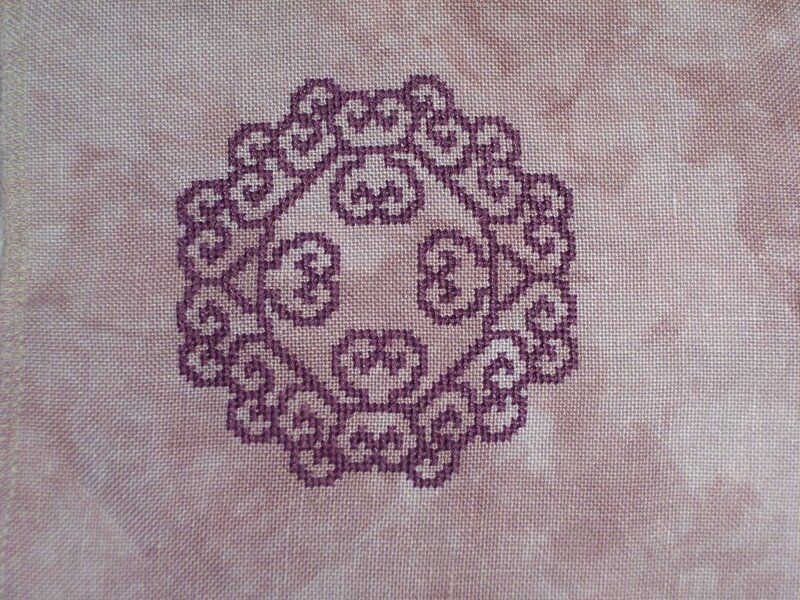 The one bump on the side is an arch stitch, and another one will be going on the other side. It's fun and I've gotten the most time consuming part done, so this is going into my immediate rotation. 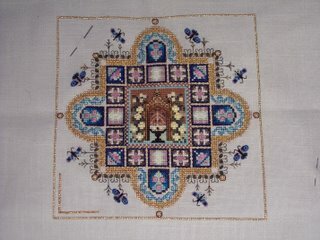 I hope to have it done in the next month or so. 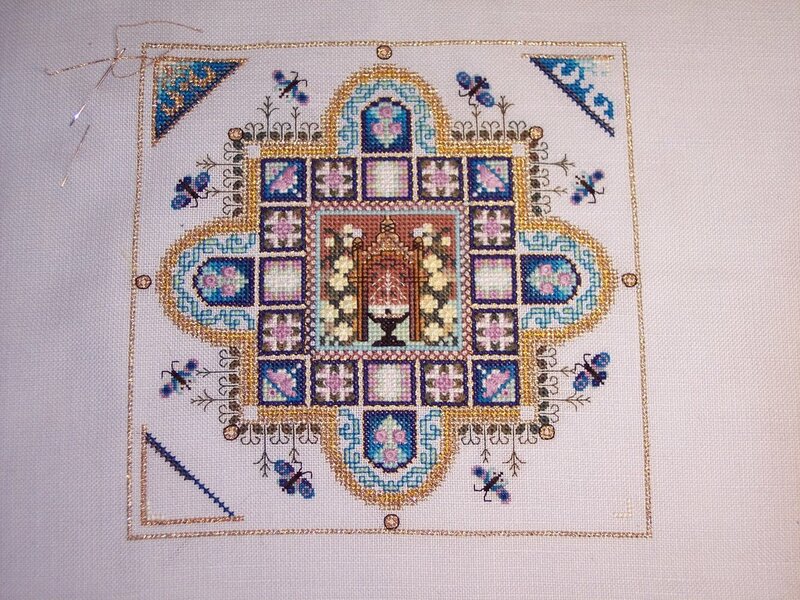 So, as you can see, I made more progress on the Medieval Town Mandala than the Midi Mystery. I'm feeling all out of sorts partially because I've not made much progress on anything last week and this week. At least next week goes back to normal, I hope. I just hope I don't get sucked in on my jury duty the week after. That would be yet another week with nothing done! As you can see, I made some, but not a lot of, progress on the panda last week. 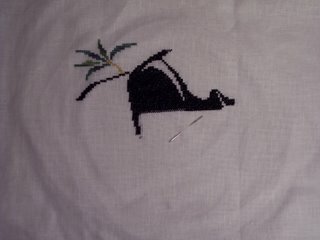 I haven't stitched on it at all since the photo on Saturday. 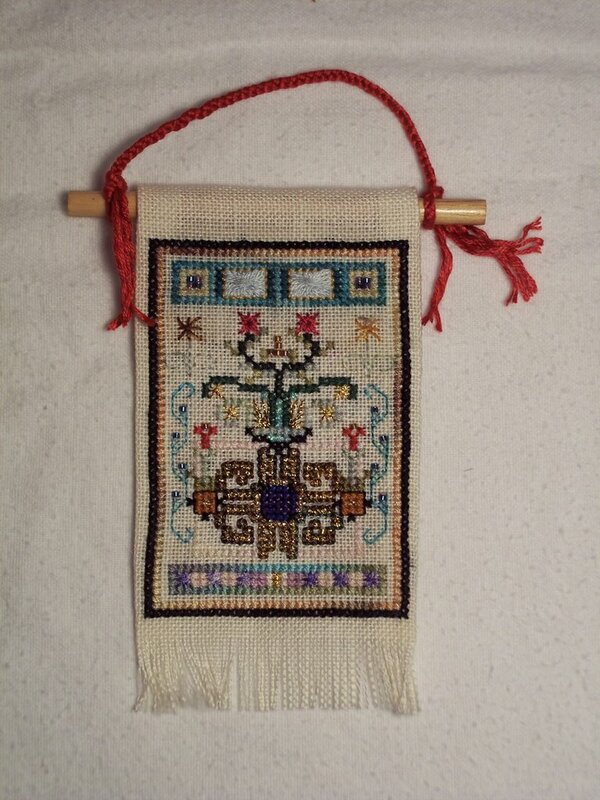 I've been adding a new project to my list at Seminar - a beaded ribbon purse. The class ended this afternoon, and I got about a third of the way through the project ... so ... you get new photos next week. I didn't get much done this week - had to do a lot of extra kid running around in preparation for going to Seminar today. BUT ... I did finish two things! 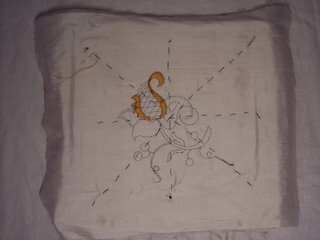 The red circular thing is called Charm and it's done on Picture This Plus fabric. 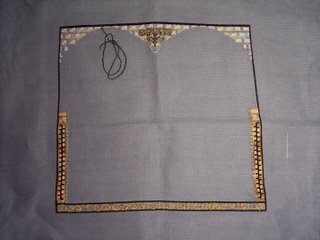 You haven't seen it before because it was my purse project - the one I work on when I'm waiting for something. 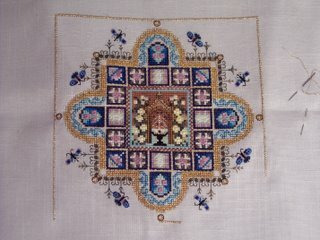 I'll be putting a butterfly charm in the middle and finising it as an ornament in the next week after Seminar. The other is the Loretta Spears Florentine Fantasy. I must have miscounted on the hearts downwards when I did the red one first, since they crowd up against the flower too much. Oh well - my daughter likes it and it's DONE. Now she and her father will frame it. My husband took a picture of the finished banner before I pop this in the mail tomorrow. Turned out pretty well, don't you think? This picture doesn't show it, but I completed part one! All of it! 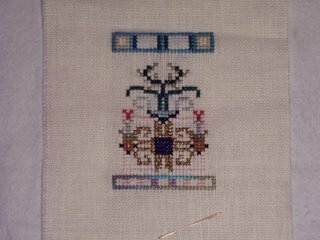 The little itsy bitsy Rhodes stitches by the columns look really good - mainly, I think, because of the turquoise color in them. On the Medieval Town Mandala, I've got a good start on the corner triangles and will hopefully finish them this week, meaning I'll get part 3 of that done finally. At least every project I did this week showed lots of progress. I needed that. Well, I have about half of section six done now, of the eight there are. It's getting there, but I don't think I'll finish it before I leave for Richmond on Sunday.It'll be close. Each time my daughter sees progress, she oooohs over it, which is a good thing. She's planning on helping her father design the frame and then painting it herself. As you can see, I finally got some real gold on my real piece. It was really fussy to do. 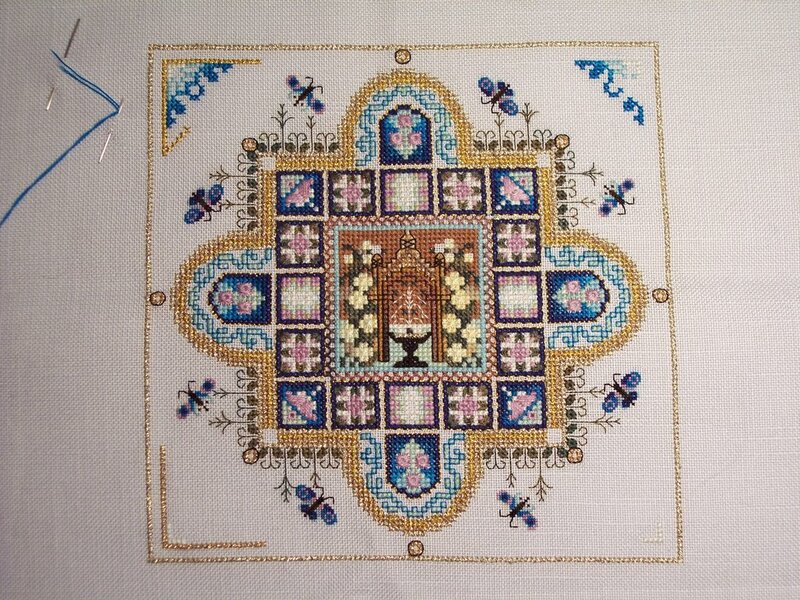 Just before I posted this, I finished the crescent moon area in gold kid too. Now on to learn something else new for this. I believe they want me to do the stems next. I'm finding this quick going when I do it so far, but not as quick as crewel. It's definitely another tool in my box, though. 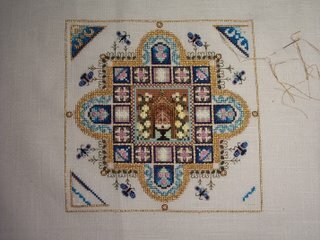 I could see some applications in regular counted stitch pieces. As you can see, I finished that really large black area - finally. 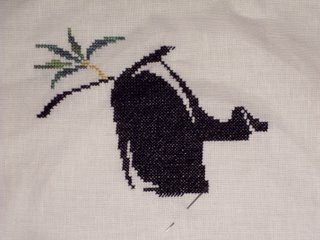 It's the shoulder and one of the larger panda's front legs. 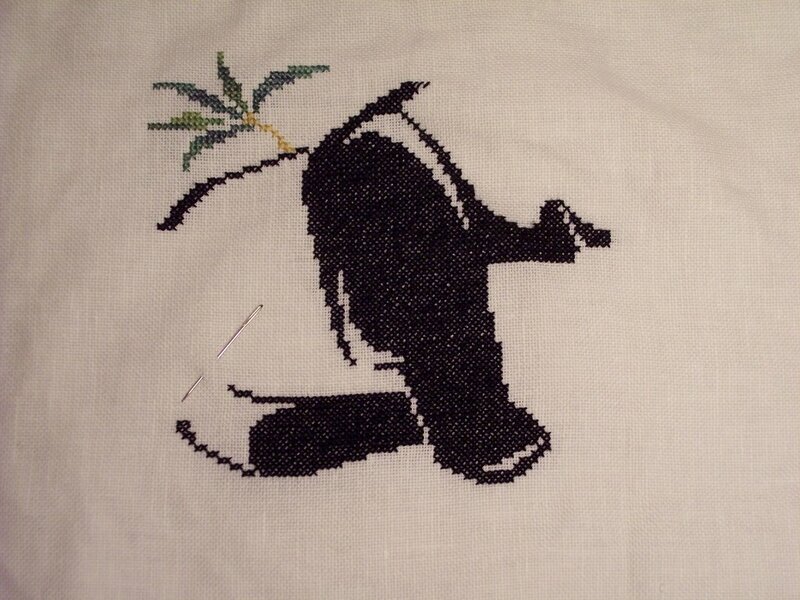 Now I'm working on the visible back leg and the back end. Should be done with that by the end of the week. I'm beginning to get tired of black. It's looking pretty good, though. 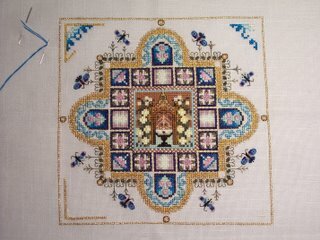 The picture here was a Cyber Workshop I took through the American Needlepoint Guild earlier this year. My husband just finished framing it yesterday. The focus of the workshop was compensation - we were to use compensation to cover all the areas and not use lines to outline anything. I really didn't like the pattern much, but Timothy did a great job framing it. It will be our Christmas present to the in laws this year. I got all the stitching done on the Mystery Ornament! 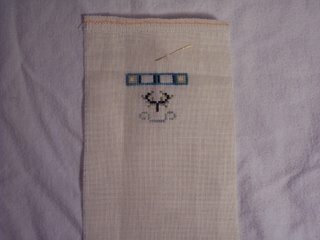 I'll be finishing it as a banner in the next day or so and then sending it to be sold for diabetes research funds. It came out pretty nice and I'm going to try to make another to keep in between all my other projects. On Monday night my daughter and I went to the local EGA meeting. The program that night was beaded memory wire bracelets from LizTech. They spread about six or seven five gallon buckets of beads and let us play. We had an hour and a half. I made these six. The yellow one's for Lynne. The rest, I haven't decided on. I'll probably keep the blue and copper. My daughter made five bracelets, and the record that night was twelve. My daughter had a lot of fun and didn't think all us old ladies were dull. The shiny circle is my very first attempt at "real" goldwork. 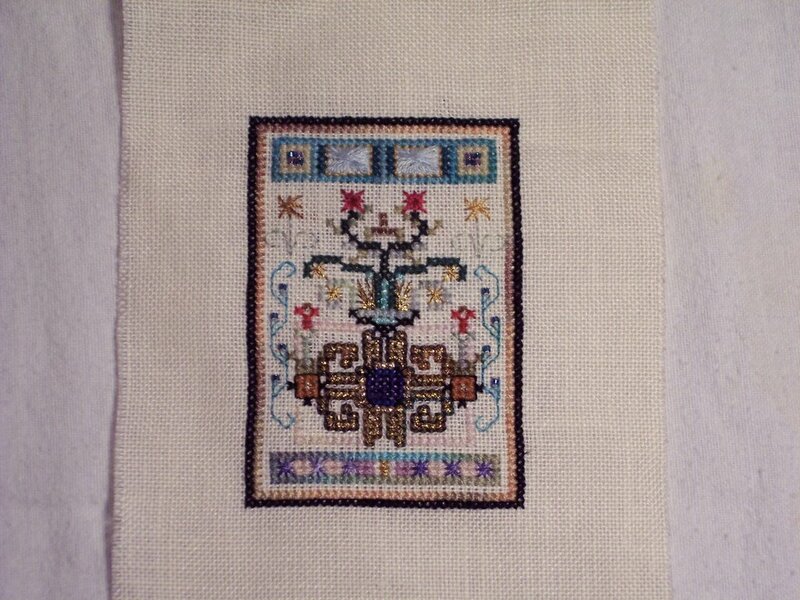 It's on the "sampler" for the course, which is basically a doodle cloth. 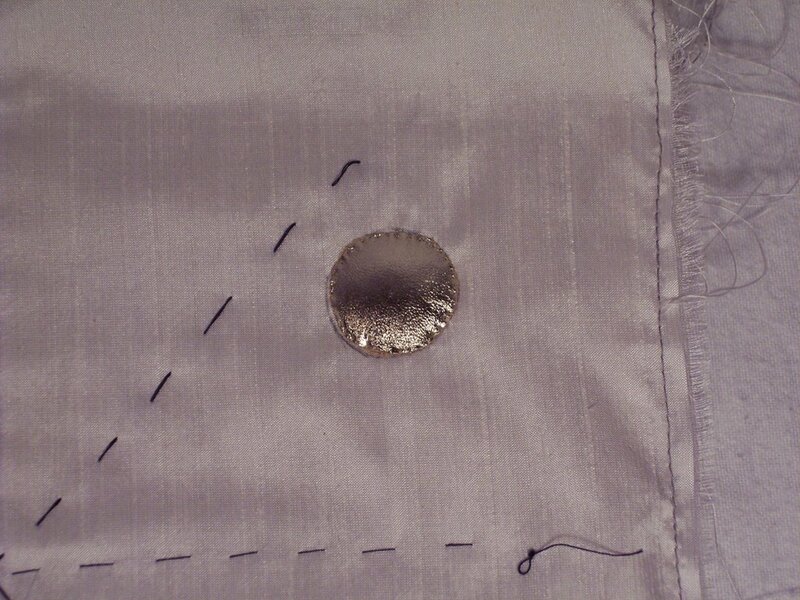 The circle has three layers of felt underneath, graded to have a smooth buildup of padding. 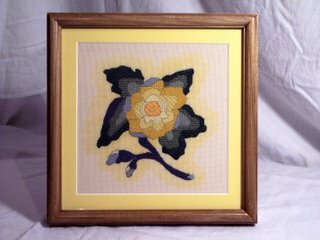 The real goldwork flower was started - how they expected us to go from simple circle to these shapes I don't know, but they did. 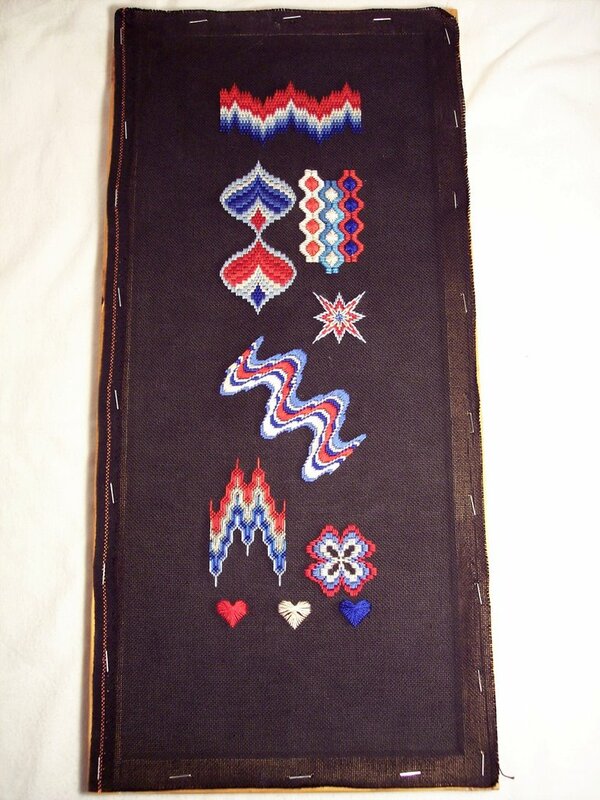 So it has, in this picture, its layers of felt built up. I finished sewing on the leather with a size 12 between last night. Argh, that needle's eye is small and is hard to catch the leather on. Anyway, it's at least progressing and I'm learning a completely new technique. 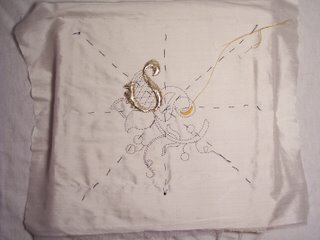 Althoughthis picture was taken Saturday evening and doesn't show the final line of stitching, I finished the evil ribbon today. Okay, it looks good BUT it was a pain to stitch on the diagonal and on black congress cloth. 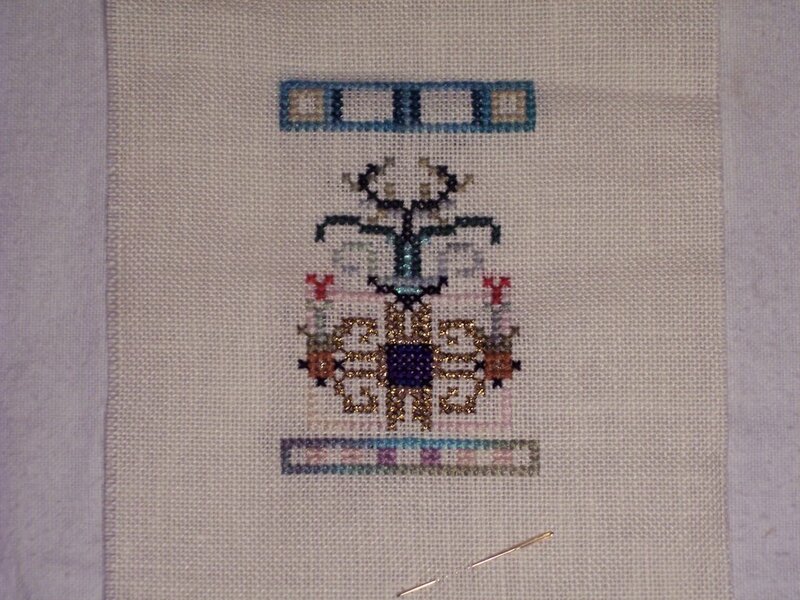 Now to start the last three areas, all of which are much smaller than the ribbon. 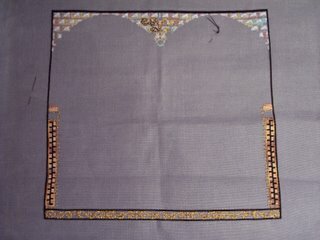 As promised, I finished the metallic border around the area. Unfortunately, I didn't get much farther. 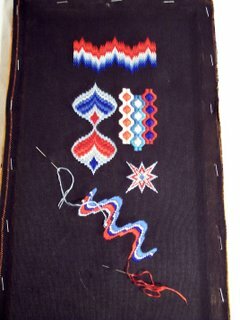 I'm still not rid of Treasure Braid yet for a bit, as the triangular motifs inside are outlined in another color of Treasure Braid. 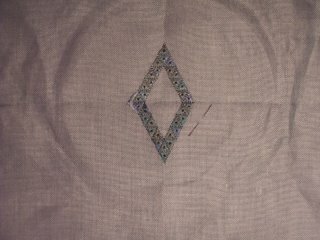 There's some silk in the triangles, at least, and hopefully I'll be able to use it this week. On the Mystery, my goal for the week was a bit ambitious. 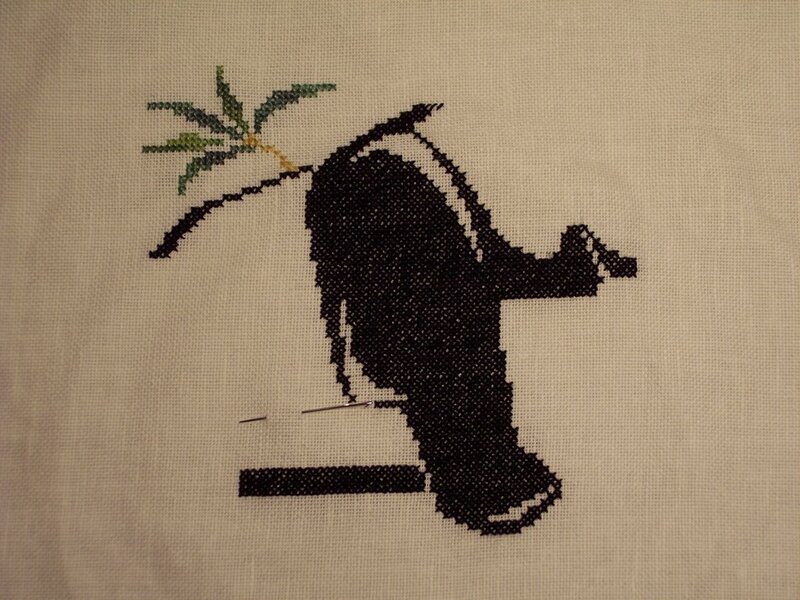 On the other hand, I did get the top portion completely backstitched. Now I just need to do the bottom half. Maybe I'll get it done this week. 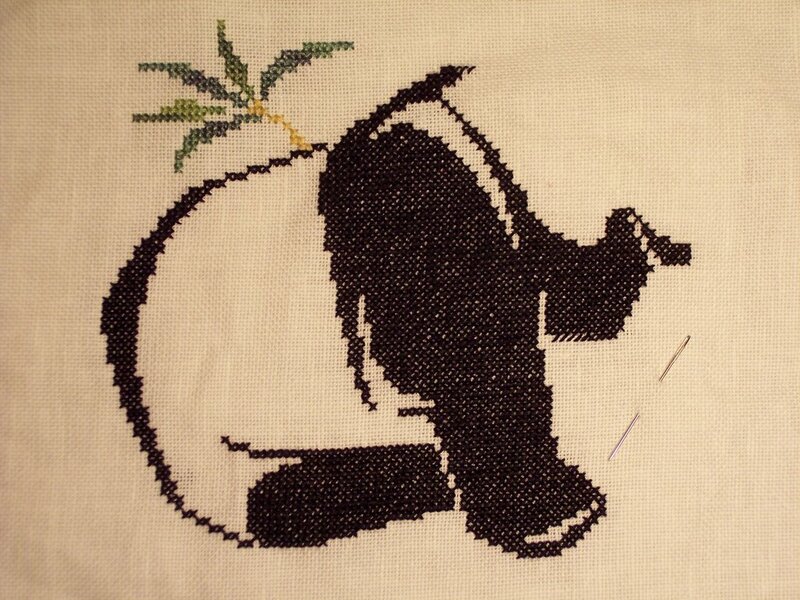 Well, I'm over halfway done on this large black area on the panda - the largest in the piece. These pictures were taken yesterday evening and I've made a bit more progress on the panda since. I'll definitely have this large area done in a week. And the Mystery Ornament - I have six more cross stitches and then the specialty stitches and it's done. Since it's one of two ornaments I have to put in the mail by the 20th, I've been taking it with me to work on while I wait for my children to get done with various things. LOTS of progress since last week because of that. I'll let you draw your own conclusions about how much time I spend waiting for my kids. I haven't even started the other ornament yet - it will probably be the Chatelaine freebie Christmas mandala on her website. I'll do the same kind of thing with it. 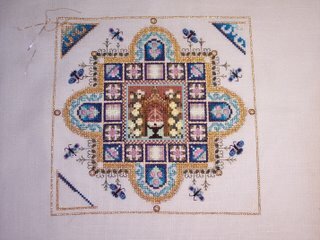 If that doesn't get finished, I have the pulled thread ornament I finished last month to send instead. 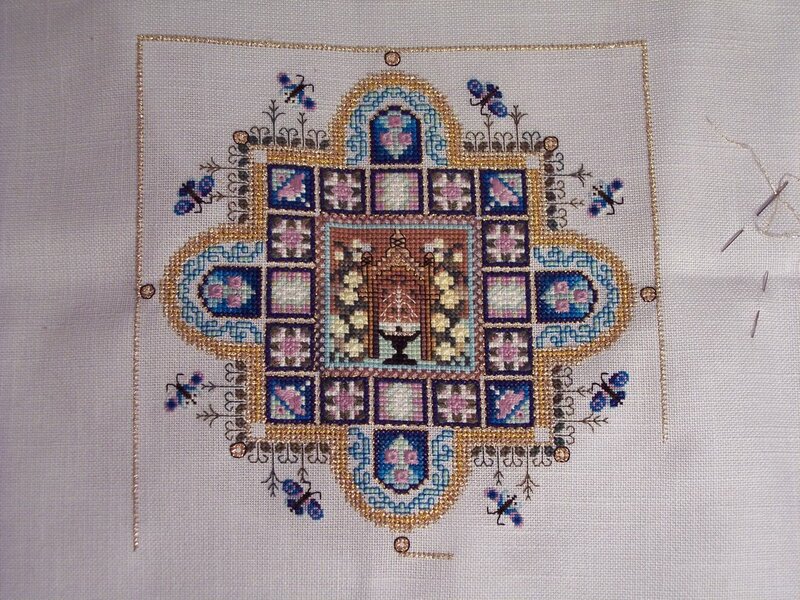 It's at an exhibition at Quiet Valley Living Historical Farm right now; my local face to face chapter of the EGA, Pocono Mountain Stitchers, holds one there every other year. 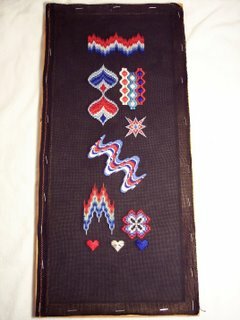 They thought it was good to have projects of every size and type to encourage people to stitch. The exhibition's not judged except by those who walk through and cast ballots for their favorite piece. I don't expect to get that! 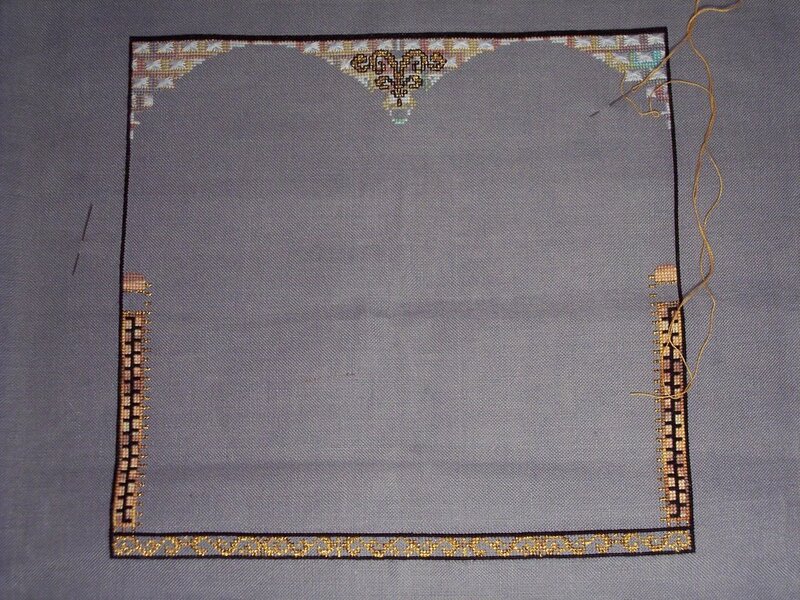 Well, the bargello is slightly bogged down like everything else. Since this picture was taken, I've completed both the stripes in progress. The goal for this week is to get that big ribbon done and get back to the fast stuff. I have only two and a half more weeks until Seminar to get it done. At least I don't have any prework for my courses. 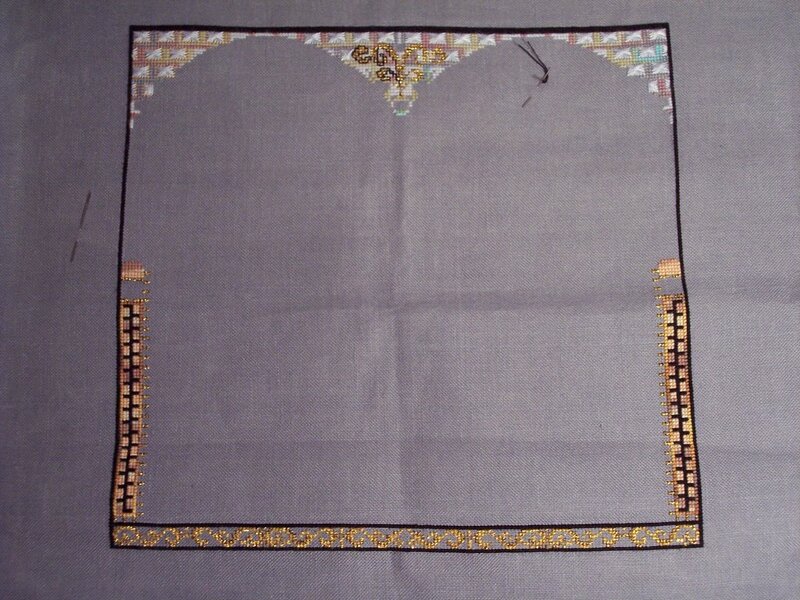 I got all the Rhodes stitches done at the top of the arches of the Midi Mystery - now to finish backstitching the central ornament and them before I can start on the lower Rhodes stitches. Of course, it being the first, I fell further behind on the thing because Martina released part 4 today. Maybe I can get part 1 done and get to part 2 before the end of October. 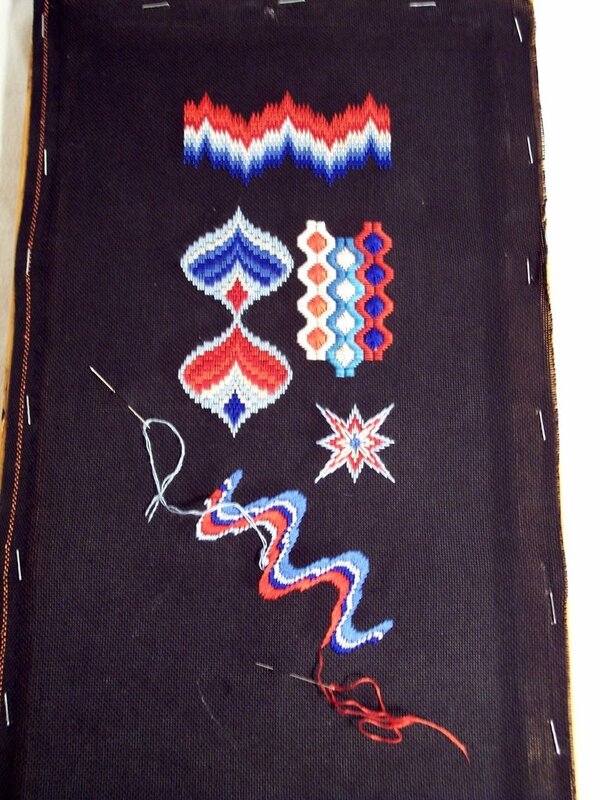 On the Mandala, I ended up getting more of the Treasure Braid border done and will definitely finish it by the end of the week. I feel like I haven't made much progress at all! So I've made some progress on these two - this week was a slow week; probably because I had to do a lot of extra stuff like take my daughter to the dentist (She's going to need "quality time with the oral surgeon" to deal with her wisdom teeth. She's thrilled.) and all the extra things my husband normally does, since he wasn't here until late Thursday night. He's here until Wednesday afternoon and then again flies out. At least it means lots of frequent flier miles. The large black area is about halfway done on the panda and I think I'm going to start doing two colors per round on the ornament instead of one, since there are so few stitches per ornament. 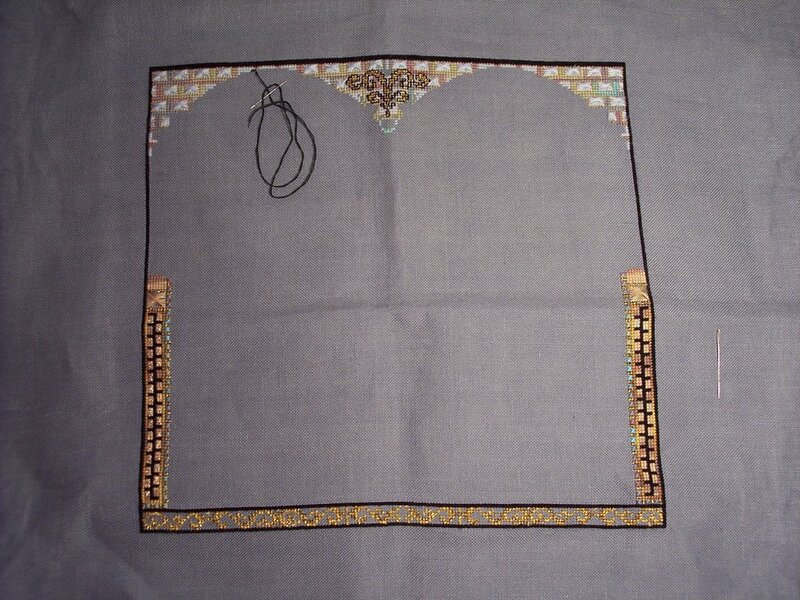 I managed to get all the running stitch outline on the silk. 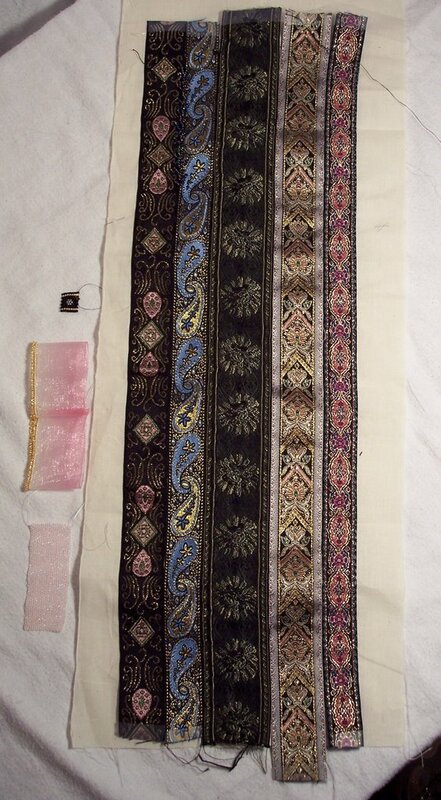 I got a really good deal on it from Plumridge Silks. They have a closeout duiponi package for about $50 that gives you 8 or more yards of silk. 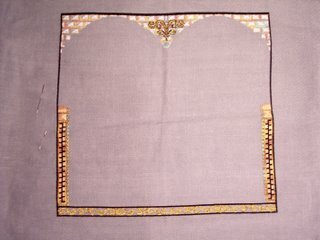 It's fabric ends and can be as much as two yard pieces. Excellent stuff. Anyway, the picture my husband took tonight is before I got the paper off. I can't wait to start the next step, even though I have no idea what to do. Probably practice on the sampler they are having me do at the same time. Anyway, it's really visible progress!